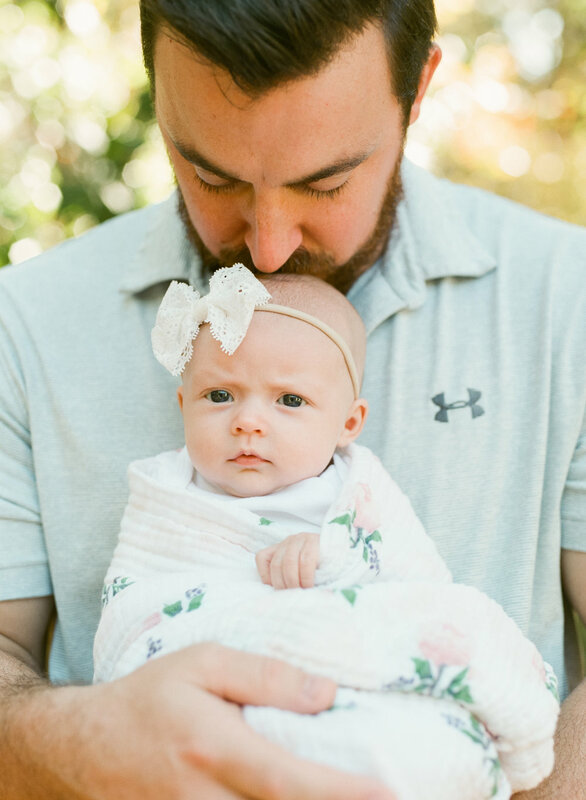 A darling baby girl with perfect soft baby skin…glowing parents…and a beautiful day in Raleigh, North Carolina. This session was truly heartwarming! My sweet readers, meet baby Rowan. She was born in September and is just as cute and huggable when you meet her in real life. We walked inside and outside of the families home and took pictures in their favorite cozy spots. We also peeked in the nursery and snuck some photos on my film camera of the gorgeous decor. Y'all check out the modern wreath above Rowans crib - it's to die for! 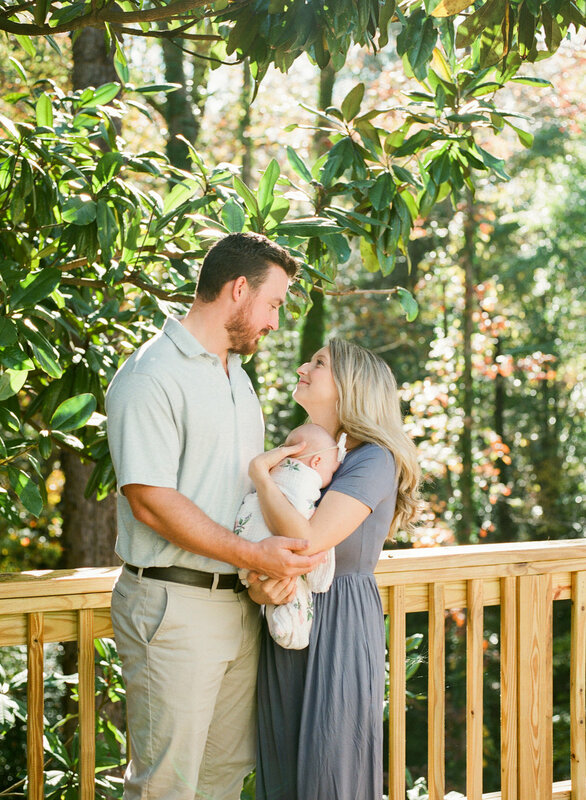 It's really a gift getting to photograph new parents.These two were smitten with their new little babe and it was so special to observe and document this precious and sweet time in their lives. The mother had such a peace about her that really resonated with me. One thing that I would like to share with you is that this session was done at 6 weeks old, instead of my typical 4-8 days after birth. 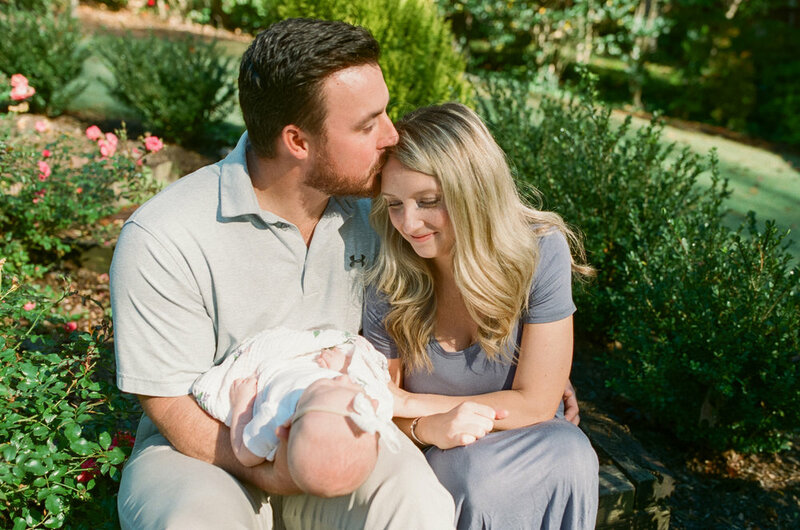 One of the beautiful things about scheduling your newborn session at this time is that the couple has grown more comfortable as parents and are starting to develop a routine. Also, baby has started to develop but still remains teeny tiny and is as cute as ever to photograph. If you weren't able to schedule a session right after birth, I would really like to encourage you that it's definitely not too late! Your little one is only this tiny once and it's such a remarkable season of of life to document for years to come!